Set oven to 180˚C and grease a 23cm springform pan (with removable side and bottom). Combine biscuit crumbs and butter in a bowl, mix well. Press over base of pan, refrigerate for 30 minutes. Beat* cream cheese, ricotta and vanilla until smooth, add brown sugar, beat until smooth. *Avoid over-beating the batter. Over-beating incorporates additional air and tends to cause cracking on the surface of the cheesecake. Beat in eggs one at a time, then flour. Stir in the chopped pecans. Pour filling into crumb crust, bake for 50 minutes or until set. Please bear in mind that cheesecake baking times are varied due to the different types of ovens. The cheesecake will continue to bake after being removed from the oven. The center of the cheesecake should be just slightly moist when it is ready to be removed. Upon removal from the oven, loosen the cheesecake from the edge of the pan by running the tip of a knife between the top edge of the cake and the side of the pan. This allows the cake to pull away freely from the pan as it cools. After the cheesecake has cooled completely, gently loosen the entire side of the cheesecake from the pan with the tip of a knife while slowly releasing the springform pan clamp. Carefully remove the side of the pan. Let it cool over the kitchen counter for about an hour, then cover it and refrigerate overnight. To make the toffee, combine sugar and water in a small pan, stir over low heat until sugar is dissolved, then boil rapidly without stirring until mixture turns a light golden brown, about 5 minutes. Add pecans, then pour onto a greased oven tray. While the toffee is setting, remove the cake from the springform pan, placing onto a serving plate. To make the caramel topping, combine brown sugar and butter in a pan, stir over low heat without boiling for about 5 minutes or until smooth and thick. While the topping is hot, pour it over the refrigerated cheesecake and spread to the edges. Once it has set a little, place the 12 pecans and berries around the edge, in a decorative ring. Once the toffee has set, break it up as finely as desired. I use a meat tenderiser, but it can be messy! Sprinkle the toffee to cover the middle of the cake. Slice and serve! 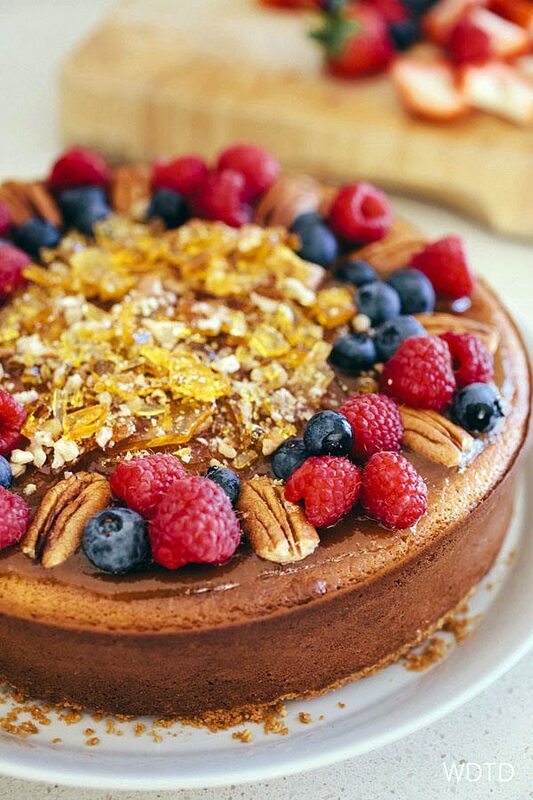 This entry was posted in Desserts, The DIshes and tagged berries, cheesecake, cream cheese, pecan, ricotta, toffee. Bookmark the permalink.